Something slightly different - a press release reproduced here verbatim! Stone adds value to construction projects. But it is not always the easiest of materials to get to grips with. Don't worry, help is at hand at the Natural Stone Show at ExCeL London 28-30 April. There is no better way of understanding a complicated subject than getting hands-on experience of it, which is what the Natural Stone Show offers. Natural stone is used for just about every area of construction, for exteriors and interiors. It can be walls, cladding, roofing, paving, floors, kitchen worktops, fireplaces, bathrooms, bedrooms. It is used in the largest office and hotel developments. It is chosen for mansions, as well as a lot of more modest houses. It can be seen in major urban regeneration projects as paving, kerbs, setts, walling and street furniture and private domestic patios. In construction, stone is king. China and India are major suppliers of natural stone to the UK. They are both countries blessed with huge quantities and diversity of stone, not least (but certainly not exclusively) polished granites, so popular for kitchen work surfaces. China and India also supply a lot of granite and sandstone used in hard landscaping in the UK. Companies from both countries will be represented at the Natural Stone Show. From China come the likes of A Plus, Huangchang, Nanjing Ceicai, Xiamen Chitrust, Yantai Yuyi (there are more) and from India major suppliers including Covenant Stone, Natural Stone Concepts, Ravileela Granites, RR Paving, Stone International and VJ Quarries. Of course, when you think of stone you tend to think of Italy, for centuries the world's largest supplier of stone and still Europe's main stone trading country. Italy's marbles (and, indeed, marbles, granites and other stones from all over the world) are supplied through the UK's major wholesalers – such as Stone World, Stonecrest, Trade Price Stone, Global Granite & Trading Company, Nile Trading, Rocks Forever and Stone Consulting, all exhibiting at the Stone Show. But Italian Marble companies will also be exhibiting in their own right, including leaders such as Ceresa Marmi and Marmi Alberti. Another important stone supply country for the UK is Turkey, the source of so much of the travertine laid on domestic and commercial floors, although it is also a producer of many other fine marbles. Companies from Turkey exhibiting at the Stone Show include Ataymer Medencilik, Finike Marble and Naturelmar. Spain and Portugal have 18 companies exhibiting, including leading international players such as Pinacas and Granitos Vincios from Spain and Mocamar and Dimpomar from Portugal. Egypt is starting to make inroads to the UK and two of its stone suppliers, Alex Tiles and the Haddad Group, will be showing their products. The previous Stone Show back in 2013 With the outlook for construction better than it has been for some time (the latest figures show growth again in November, this time of 3.6% compared with a year earlier, and the Construction Products Association's Autumn Forecast predicts growth in the UK of 5.3% in 2015) it is not surprising that the Natural Stone Show has grown 20% since the previous exhibition in 2013 (it is, as it has been since it was launched in 1995, held every other year). Although most stone used in the UK is imported, the British Isles also produce their own stones – and there is more British stone being exhibited at the Stone Show this time than ever. Indigenous stone is important as cladding on commercial buildings and walling and architectural detail for housing, as well as for interiors, especially floors and stairs, and for conservation work. The UK stone on show includes Portland limestone from Albion Stone and Portland Stone Firms, Bath Stone from the Bath Stone Group, Doulting from Doulting Stone, Caithness from Scotland, Forest of Dean Pennant, Kentish Ragstone from Gallagher, various limestones from Ham & Doulting, Ham Hill stone from Harvey Stone, Purbeck and other limestones from Lovell Stone Group, Johnson's Wellfield's famous Crosland Hill sandstone, the ironstone and limestones produced in conjunction with Marshalls by Johnston Quarry Group… the list goes on. There will also be plenty of stone treatments and fixing systems on show, as well as machinery, tools and consumables essential for the processing of stone. The Stone Show is, as ever, supported by Stone Federation Great Britain, the body that represents the interests of the natural stone industry in the UK. The Federation has a 'Village' at the heart of the Show with its own stand surrounded by member companies, including consultancies such as Harrison Goldman, Sandberg and Stewart Design. They will be able to offer advice and help with any specific enquiries you have relating to the choice, design and use of stone. 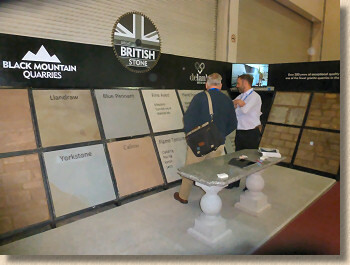 There is also a conference, The Natural Stone & Building Conservation Conference, held in association with the exhibition on the floor above the Show, so you are not disturbed by the noise of the exhibition itself. The conference is divided into thematic days. Tuesday is Architects' Day, which will once again be led by California-based international stone consultant Vince Marazita, who is a top-notch presenter as well as a stone expert – you will definitely not get bored. The event is sponsored by Portland limestone producer Albion Stone. The other two days of the show see a stone trade day conference, run in conjunction with Stone Federation, and a heritage day in conjunction with English Heritage. The stone sector is a small but influential niche of the construction industry. Its products often wow the uninitiated (sometimes even the initiated) and you will be able to view some of stone's most impressive projects at the Show in a picture gallery of the projects in the Natural Stone Awards presented at Russell Hotel, London, in December. If stone is not an area you have explored yet, the Stone Show would be a good place to start. And if you are already familiar with using stone in your projects, there are always innovations to surprise you. 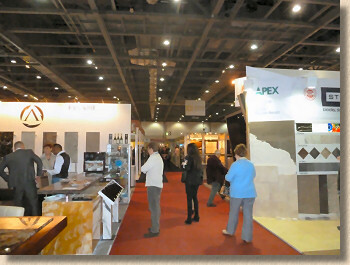 Come to the Natural Stone Show at ExCeL London on 28-30 April to see what the industry has to offer you.